Appropriation—the strategy of selective borrowing—is a common theme in the history of modern art. Since the late nineteenth century artists have both copied and imitated the work of other artists. Consider, for example, the work of Vincent Van Gogh, who copied the format and the compositions of Japanese color woodcuts (ukiyo-e). In the twentieth century, Pablo Picasso imitated the form of African masks for the faces of several female figures in his well-known painting, Les Demoiselles d’Avignon of 1907. The appropriation of Leonardo da Vinci’s Mona Lisa by Marcel Duchamp in 1919 was a radical gesture, where Duchamp drew a handlebar mustache and goatee onto a postcard-size reproduction of Leonardo’s famous painting. 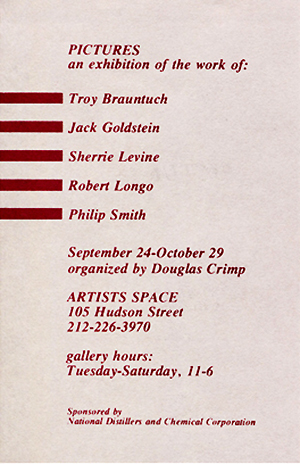 Many of the artists now known as the “Pictures Generation” were so named mainly because of their inclusion in the 1977 exhibition “Pictures” at Artists Space in New York City. The five artists included in this exhibition—Troy Brauntuch, Jack Goldstein, Sherrie Levine, Robert Longo, and Philip Smith—explored the boundaries between reality and images, originals and reproductions. This concern with “pictures” expanded beyond those five original artists to include many others working in this period as well. In a retrospective exhibition at the Metropolitan Museum of Art in 2009 the work of artists Barbara Kruger, Louise Lawler, Richard Prince, David Salle, Cindy Sherman, and Michael Zwack was included under the broad category of Pictures Generation art. Despite the diversity in the subjects and approaches of these artists, most did work in photography and film—two media particularly suited to the blurring of boundaries between originals and reproductions, and between the real world and the world of images. From the moment of its invention, photography inspired debates around the question of originality; with one negative image capable of producing an unknown number of positive prints, can we consider any of those as original? Artists directly engaged with appropriation in the 1970s were doing so under the influence of postmodernism. In previous generations, artists were praised for their ability to create new ideas and objects. Originality was the hallmark of modernism, and artists were presumed to be independent creators of objects and their meaning. However, by the late 1960s such ideas were beginning to break down. New theories about the impossibility of originality developed in the field of literary theory began to permeate the art world. A key text of this period was a 1968 essay by French philosopher Roland Barthes entitled “Death of the Author.” Barthes realigned the focus of literary theory from the creation of language to its enunciation. This meant that the act of interpretation was more important than the act of creation. Artists were suddenly freed from the burden and the expectations of complete originality; what mattered now was how artists could interpret, reconfigure, and reposition already extant works and ideas to create other meanings. 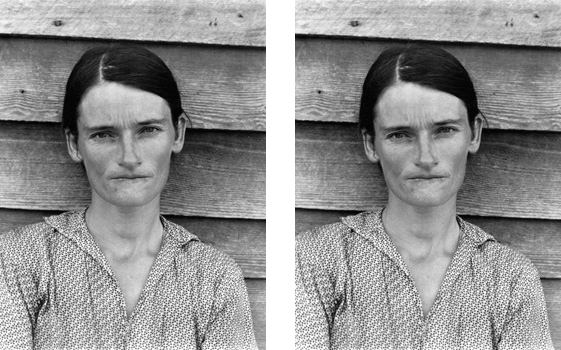 Levine’s After Walker Evans expresses these postmodern ideas. It can be difficult to locate the “original” in Levine’s image. Instead, the focus here is on how the artist uses the medium of photography to disrupt modernist lineages, which frequently put white, heterosexual males at the “origin” of these trajectories. The “After” in her title refers to the existence of a prior model but underscores Levine’s break with it. Artists have continued to explore strategies of appropriation. 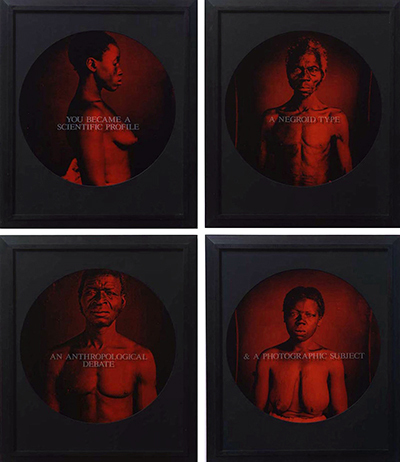 For example, in the early 1990s the photographer Carrie Mae Weems appropriated daguerreotype photographs of slaves taken in 1850 by J.T. Zealy in her Sea Island Series. Like in the work of Levine, Weems’s use of these photographs was more than an appropriation of the image itself; the focus here is on reworking the meaning of these original photographs. The nineteenth-century daguerreotypes objectify the bodies of South Carolina slaves, reducing them to specimens in order to prove a theory about the innate inferiority of people of African descent. In her re-presentation of these nineteenth-century images, however, Weems transforms the sitters of the photographs from objects to people. Her tinting of the photographs and their installation alongside a narrative gives the subjects of these images a new voice of their own, acknowledging the history of oppression from which they came. Cite this page as: Dr. Jordana Moore Saggese, "The Pictures Generation," in Smarthistory, August 9, 2015, accessed April 22, 2019, https://smarthistory.org/the-pictures-generation/.